I have participated in talk selection for conferences before, but this was by far the deepest I had delved into a track that was so close to what I see in my role as Fedora Community Lead. Thankfully, much of the day-of technical logistics were handled by the extremely capable and helpful FOSDEM volunteers and staff. As far as the pre-conference organizing, I was not in it alone. Brian Stinson and Karanbir Singh were there through the whole process of sending the CFP, vetting proposed talks, playing scheduling bingo, and making the devroom itself run smoothly. One of the priorities we had when accepting proposals was a plurality of topics and speakers. To make this happen we did two things: 1) Schedule mostly 20 minute blocks for talks (with very few 60+ minute blocks reserved for particularly meaty topics), and 2) offer up our own local lightning talks in the DevRoom. For the lightning talks, we started with some pre-accepted talks, and but kept an opportunity for folks to sign up ‘day-of’ at the conference itself (more on why that was a good idea later.) We think this was a winning combination, and allowed many people to participate in our track, and many projects to be represented. I wasn’t just the room’s moderator, I was also a speaker at the event! I gave a talk based on metrics gathered by members of the Fedora CommOps and Infra Teams to help describe where the project was at, and tell stories with data. Special shout-out to smooge, mattdm, threebean, and bee2502 for their amazing data gathering and visualization work. You can find many of the tools and scripts used to gather this data on the fedora-stats-tools repo on GitHub. This was an interesting bit of data generated during the conference that showed the distribution of operating systems accessing the FOSDEM network. All told, rumor has it there were over 8000 attendees at FOSDEM this year [Citation Needed]. This was an absolutely mind-boggling presentation to watch. Here are the facts listed in the bullet points below for this Debian-based distro, built by the largest provider in Nuclear Power in the country of France, and in the world. I was heads down all day, and it turned out that we had somehow removed the “10 minute passing periods” that we had kept during the first day of the devroom from our schedule leading up to the lightning talks. While I was prepping speaker materials and moderating the room, I had a fellow come up to my table and ask me if there were any lightning talk slots left. Glancing quickly at the board, I saw they were full, but, in the spirit of plurality, I knew that we had kept the extra 10 minutes in our lightning talk block, and I offered to give half of it to our prospective speaker. He accepted, and I forgot to ask him for his contact info. A few hours later, that same fellow comes up at the end of our talk and asks if they can still present. I said sure, and asked him what his name was so that I could introduce him properly. There was a pause, and I looked up from me keyboard to catch him smiling as he walked up to the front of the room and told me his name was Mark Shuttleworth. Our next speaker, Wookey, is a long time Debian core developer of many, many, years, and he was having a bit of trouble getting his laptop to connect with the projector. Mark, like a pro, kept up his low-tech chalkboard explanation for an extra 10 minutes until the technical issues with Wookey’s laptop were resolved. As soon as the projector stopped glowing blue, Mark thanked the audience and went back to the hallway track for questions. This may have been one of my favorite talks to truly appreciate how much upstream firepower had gathered into one place. My tweet below is a 140 character attempt to capture that spirit. In a nutshell, Wookey would bring up a slide with a library, tell the audience he wasn’t sure about its status, and within seconds, the maintainer of that upstream library would raise their hand, and say things to the room like “I sent that patch to the list yesterday after talking with so-and-so here at FOSDEM.” It happened at least three times, and each time it gave me even more warm-and-fuzzies to know we were bringing together so many people core to ARM development in one room at FOSDEM. "not sure status of <XYZ> lib"
This happened no less than thrice! One of the charges of the CommOps team is to help measure the action and impact of investments of time and resources that are made in the FOSS community. This, to a large extent, includes events like FOSDEM. Because events themselves happen ‘IRL’, and not mostly in revision-controlled code repositories, tracking impact can be difficult. But CommOps Metrics Lead Bee Padalkar is a Python and data wiz, who was glad to take up the challenge. Bee started by looking at attendees who got the FOSDEM 2016 Badge at the Fedora booth at FOSDEM, and then observed their activity on the Fedmsg Bus before and after the conference. Accounts which start at the conference and then become ongoing, active contributors can be counted as measurable conference success! This script is being made generalizable by Bee and the folks in CommOps, so that we can gather pre/post Fedmsg event activity like this in the future! Very exciting and groundbreaking work for our team. You can read about this on the CommOps mailing list, and stay tuned for more analysis of other conferences, and of course more pretty graphs. 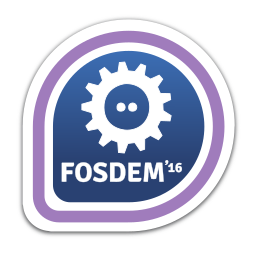 This may have been my first FOSDEM, but I certainly hope it will not be my last. Brussels is one of the most beautiful cities I have ever seen, and I loved being able to use my French (I did grow up close to Canada after all). FOSDEM was amazing, and I hope to see much more of it next year. I’ll leave you all with my parting tweet.